It has extraordinary strength, unparalleled to that of the Behemoth. However, despite its appearance and size, it shares the same weaknesses as the standard archetype. This beast boasts a mammoth amount of HP. Its paralyzing attacks make it a frightening foe; heal yourself with special attacks! 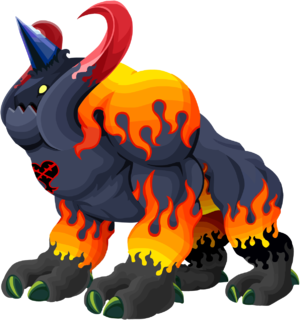 The Destroyed Behemoth, dubbed "Behemoth Ω" in Kingdom Hearts χ, is an Emblem Heartless that is found in Kingdom Hearts Final Mix. It replaces the Behemoth as one of the bosses of the Hades Cup. The Destroyed Behemoth is a massive, quadrupedal Heartless. Its body is predominantly slate grey in color, but its back and all four of its legs are decorated by an orange flame pattern. Each of the Destroyed Behemoth's legs have two toes with green claws. It has two large, curved tusks sprouting from its lower jaw that are red on their upper half and slate grey on their lower half. The Destroyed Behemoth's conical, blue horn is on its forehead. 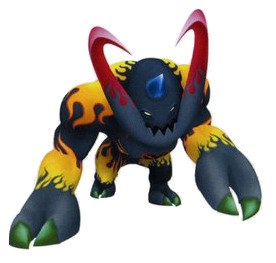 Like most other Heartless, it has yellow eyes and a jagged maw. Its Heartless emblem is on its chest. The Destroyed Behemoth's name is a reference to its large size and its destructive nature. In the Final Fantasy series, a Behemoth is a large, horned creature with massive strength. Just as the original Behemoth, its weakness is its horn, and it is immune to all elemental spells. To take it down, attack the horn incessantly. Its bolts of lightning can be evaded with well-timed Dodge Rolls, or by hiding underneath its bulk, but it will begin stomping as soon as the lightning strikes end. Sora can deal additional damage to the horn and minimize the damage he takes by casting Aeroga on himself. He can restore his MP quickly enough by attacking the horn.